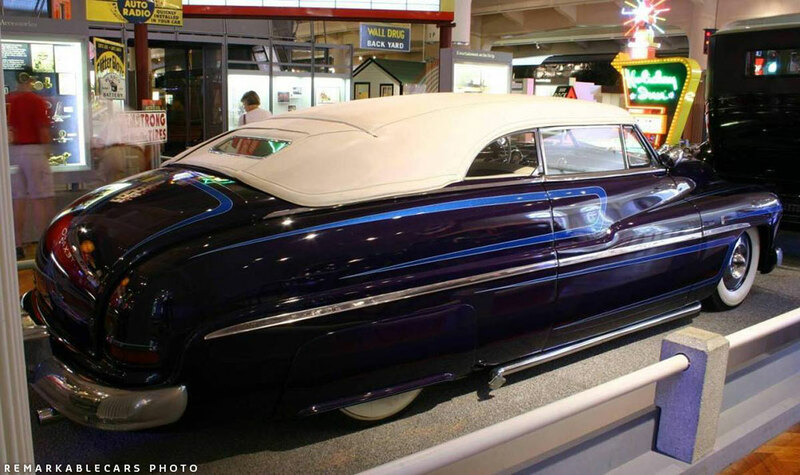 This typical 1980’s styled Custom 1949 Mercury convertible is part of the Henry Ford Museum. With its replica Barris crest and typical late 80s custom styling elements it looks very much like it was built during the custom car revival of the 1980’s… but is it? This article was updated with new information on June 16, 2015. Scroll down to below the Henry Ford Museum logo to find the update information. 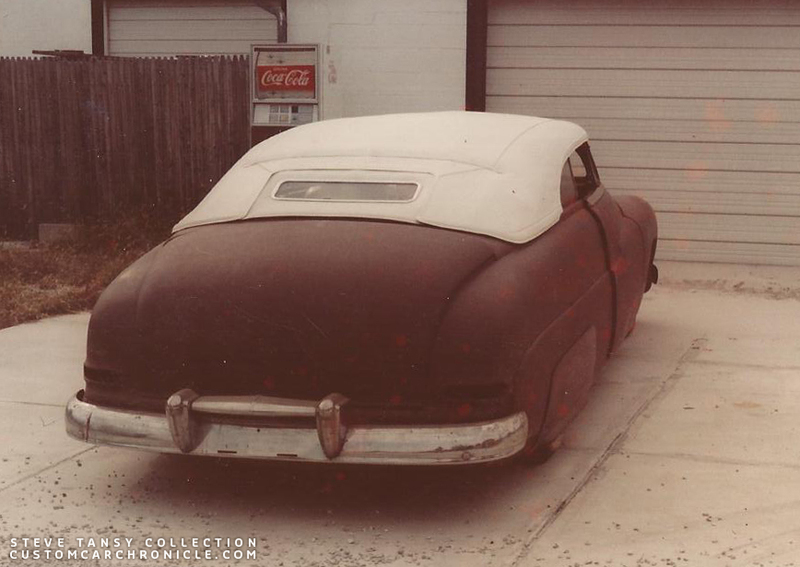 Recently I have received some new information about this 1949 Mercury Convertible that is part of the Henry Ford Museum that indicate this might be an original 1950’s Barris Kustoms created car. 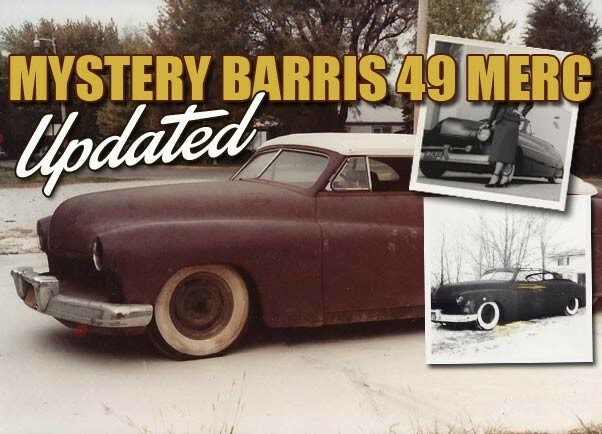 Steve Tansy send us a few photos of the Mystery Barris 49 Merc, when he started to restore the car. As well as a bit of the story as he knows it. 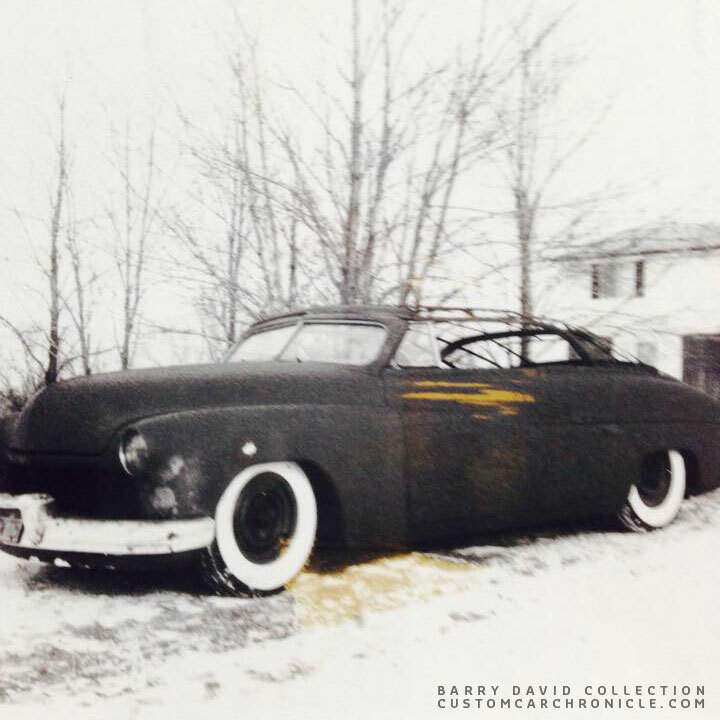 Right now I have not been able to trace the car’s complete history, and I’m not 100% sure it is an original Barris Kustoms created car with Carson Padded Top and interior. However all the signs we have seen and heard so far look like it really is an original Barris Custom from the early 1950’s. Hopefully with the help of this article we will be able to get in touch with people who might know a bit more about the history, and how it got from the West Coast to the East Coast of the US. Bob Larivee owned an 1941 Ford long door coupe with full fade away fenders which was originally owned by Don Reid of Salinas in the early 1950’s. He traded this Ford to Dr. Barry David in Detroit in 1985, and part of the trade was an unrestored 1949 Mercury convertible with padded top. Barry found this car in Hemmings in 1981. He purchased it from a gentleman in Hartford, Connecticut.Pete Marriott of Lake Orion, Mi. Did the majority of the work on the initial restoration. Barry stripped the paint and took the car apart but “Big Pete” did the metal work. 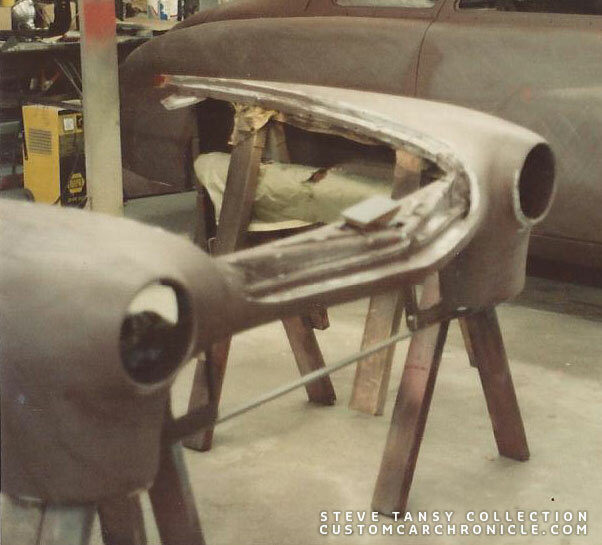 After the car was in primer Bob came along with the 1941 Ford and a deal was made. 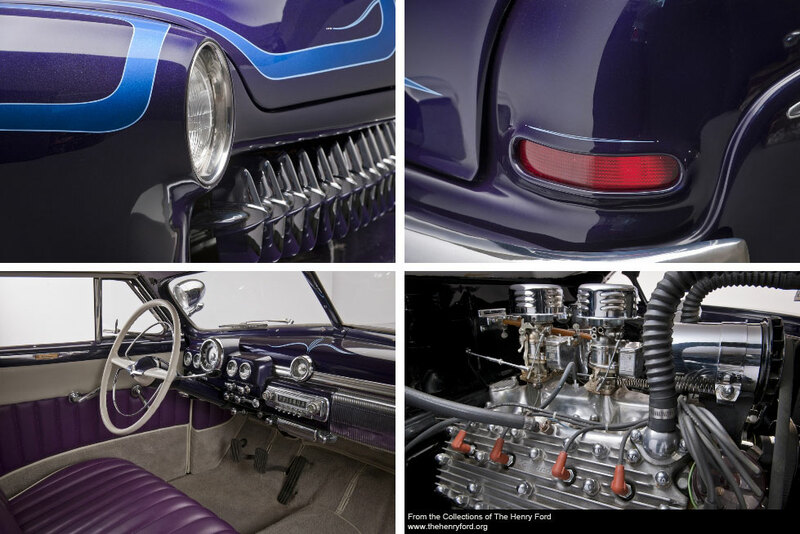 After Bob brought the 1949 Mercury convertible home he removed the Barris Kustom crests and Houser’s Carson Padded Tops tag that was on the header of the padded top for his own personal collection. Steve Tansy was then asked to do a full rebuilt/restoration on the Mercury. Bob never mentioned, back in 1985, that he had removed the barris crests and interior tag, and at the time there was no other information about the car available. It was just a nice chopped Mercury convertible in need of restoration. This is how the Mercury looked when Steve started the restoration in the 1980’s. Barry David already installed a more “modern” interior that was going to be back dated at a later point. Taillight openings on the rear fender look similar to what was used on the Louis Betancourt Mercury created by the Ayala brothers. The original grille that came with the car was to far gone to be used. According the Steve he took the easy way out and installed a corvette grille. The car was painted dark blue metallic with light blue white pinstriped scallops. In a typical way for the era. A set of replica Barris Crests was added to the car at a later point. After the restoration was completed Bob offered it to be displayed at the Henry Ford Museum, and later he sold the car to the Museum, and today it is still part of their collection. At the museum the car is listed as a Barris Kustom Industries creation, with Carson Padded top, but as far as we know this info was added based on the fact the car came with the replica Barris Crests. The way the car looks after the restoration makes it look like any typical 1980’s lead-sled, and does not really representative the tru Barris Kustoms/Carson Top Shop look and feel. The one piece front end during the restoration. A few weeks ago Bob Larivee visited Steve an they started to talk about the old 1949 Mercury they had restored back in the 1980’s. Then Bob mentioned that when he got the car he had removed the Barris crests from the front fenders and the Houser’s Carson Padded Tops tag from the padded top. And that he had saved them all these years, in fact he had framed them with a photo of the Merc taken before it went to the Museum. This was the first time Steve heard about this, and it got him thinking. Using the CCC-article on Identifying the Barris Crests and the CCC-Article on the Interior tags we where able to identify the removed crests and tag as original items. 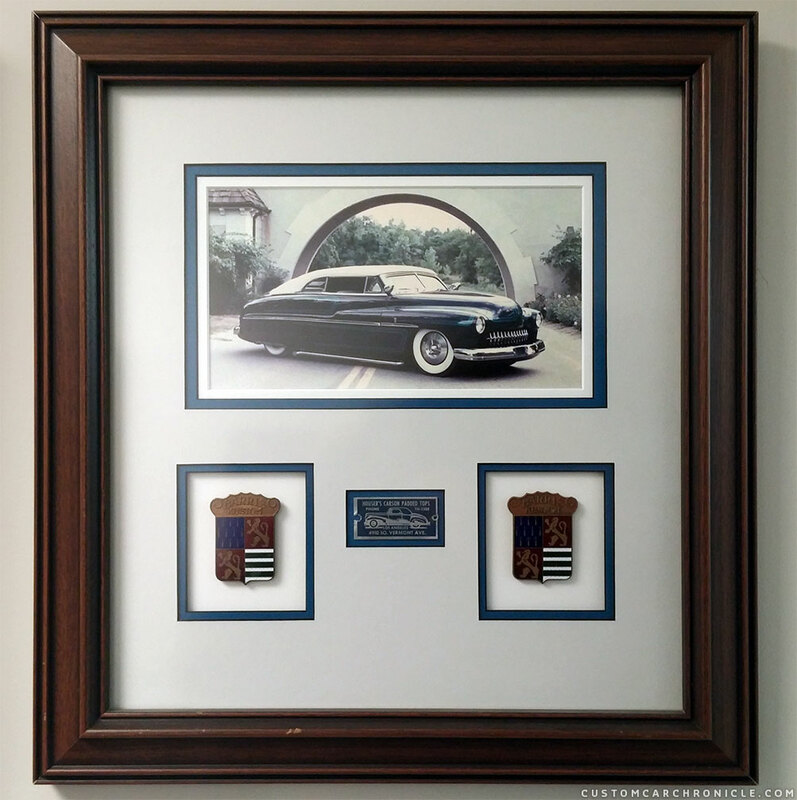 The two original Barris crests and Houser’s Carson Padded Tops interior tag Bob had saved from the car when he bought it in 1985 are framed and hanging on the wall in his home. 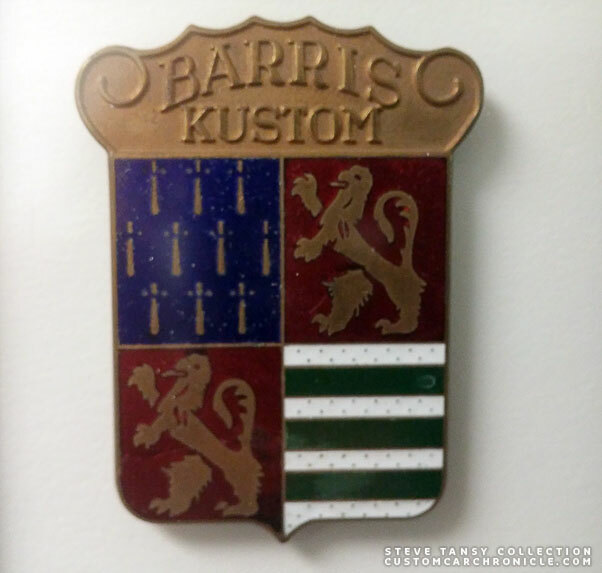 Original Barris Kustom crest taken from the 1949 Mercury convertible in 1985. 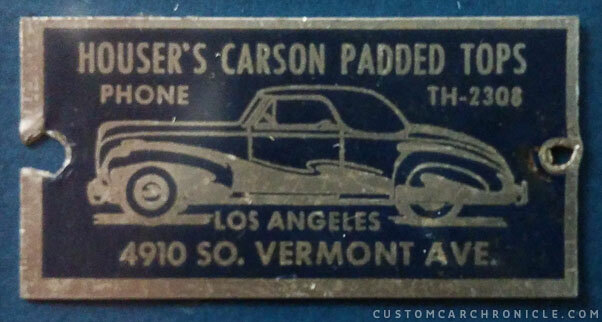 Original Houser’s Carson Padded Tops tag taken from the 1949 Mercury convertible in 1985. 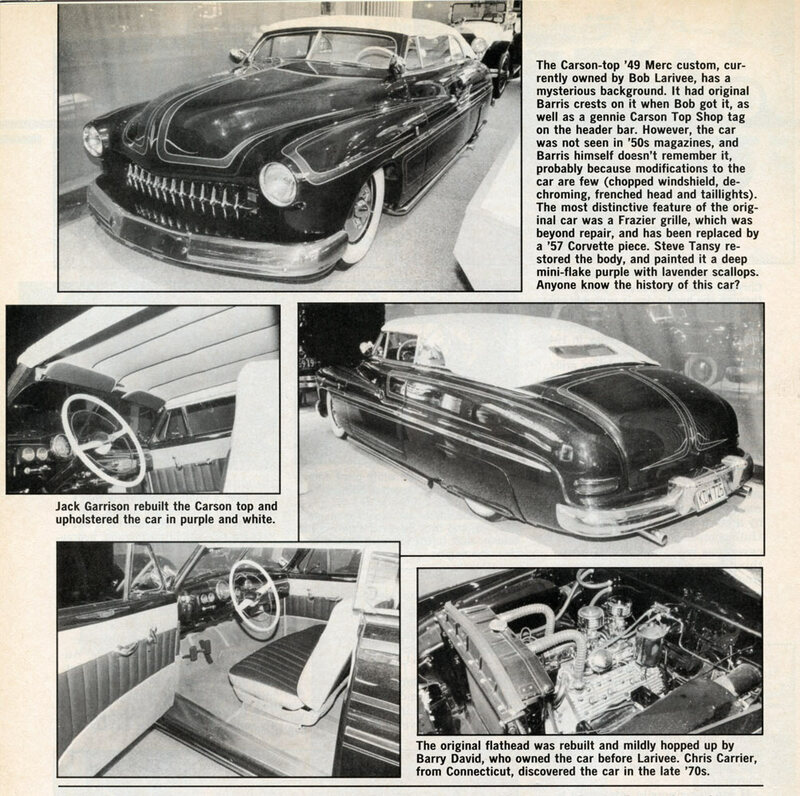 The April 1989 issue of Rod & Custom showed a few photos of the Mercury and mentioned the Barris history as well. Interesting is that it also mentioned the Frazier grille… and to bad that a similar grille was not used in the restoration. Probably would have looked really nice. This is as far as the story goes. So far nobody has been able to find any old photos of this car, how it looked before the new interior was put in the car, before the red oxide primer, or how it looked when it was freshly done. We also have not been able to find out who original owned the car. We would really like to find out more about the history on this car. Ken Gross, organizer of the Pebble Beach Concours has showed an interest in this Mercury for the event in August 2015. Creator Notes: Manufactured by the Lincoln Mercury Division of Ford Motor Company with customization by Barris Kustom Industries of North Hollywood, California. Carson Top Shop in Los Angeles, California made the convertible top. 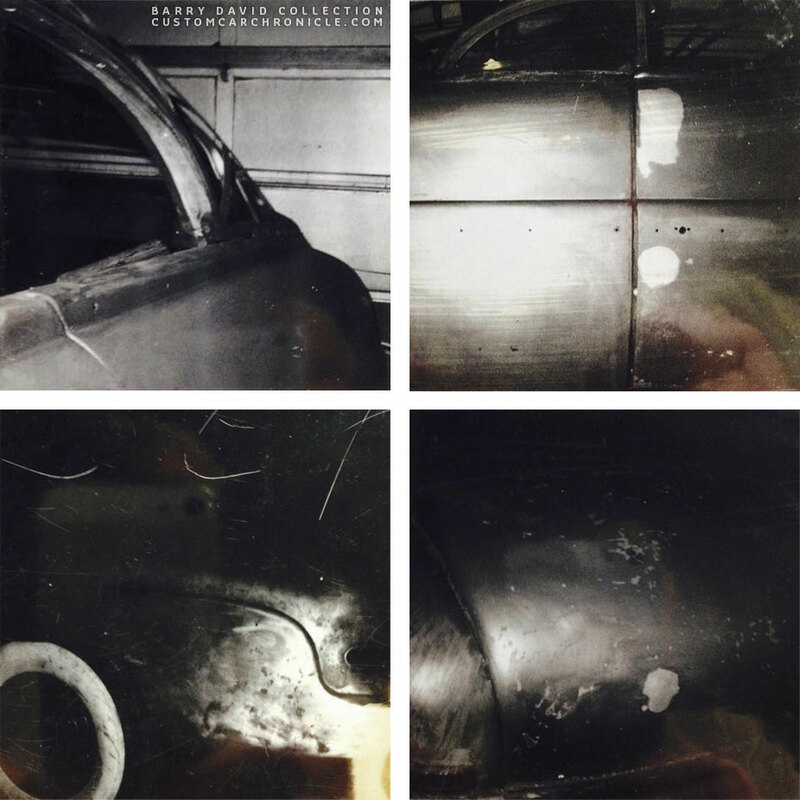 After publishing the story on this mystery Barris 1949 Mercury that is being displayed in the Henry Ford Museum, we have gathered a bit more information about the car. 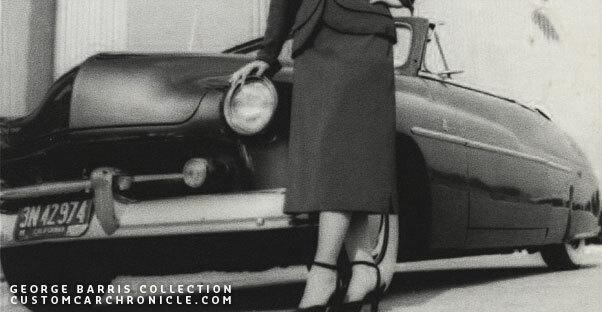 And it looks like we have located two photos of the car from the early 1950’s. We are not 100% sure these two old photos are in fact the same car as in this article, but more than likely they are. When Barry David bought the car back in 1981 the car came with a grille that was made up from Henry J end bar/parking lights and a center created from a 1953 Dodge grille. Sadly non of the photos Barry has showed the grille. When the car was sold to Bob Larivee the grille, which was in very bad state, went with it, but it is unknown what ever happened to it. In any event it never made it back onto the car. 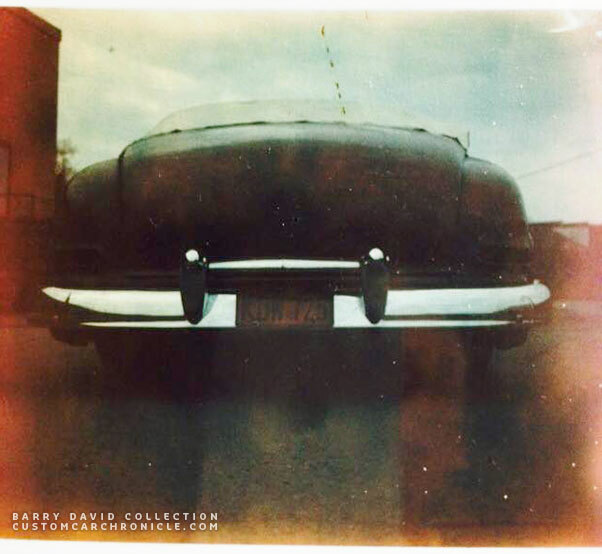 Barry confirmed that the grill shown in the low angle photo from the 1953 photo is identical to the one that came with the car when he bought it. The grille was stored with other parts in the trunk of the car at that time. According to Barry there where provisions for a floating grill arrangement inside the grille opening. This is pretty much the way the car looked when Barry bought it in 1981. Barry did put the bumper guards back on the car when he took this snapshot. Couple more snapshots from the early stages of the restoration. The photo on the lower left corner shows the custom taillight opening. Another snapshot gives us a look at the bare metal body and the lead that was used to blend the new taillights into the body. Barry David bought the Mercury from Chris Carrier. Chris told Barry that he purchased the Mercury from the original owner, a Hartford native in the late 1970’s. 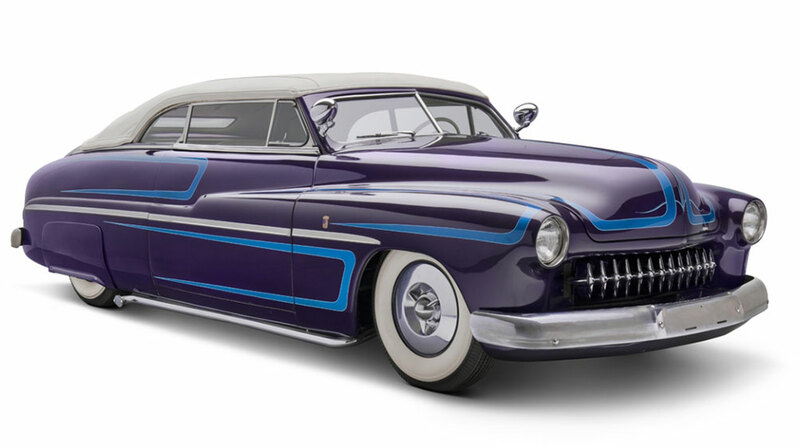 Barry also remembered that George Barris had told him the story in the early 1980’s that the original customer, who took the Mercury to the Barris shop, was in the service and had the custom work done in two stages. When he was discharged and the final work was done, George said the owner left for home “some place in the east.” George wanted to do a feature article on the car but only got a few pictures before the owner left town. 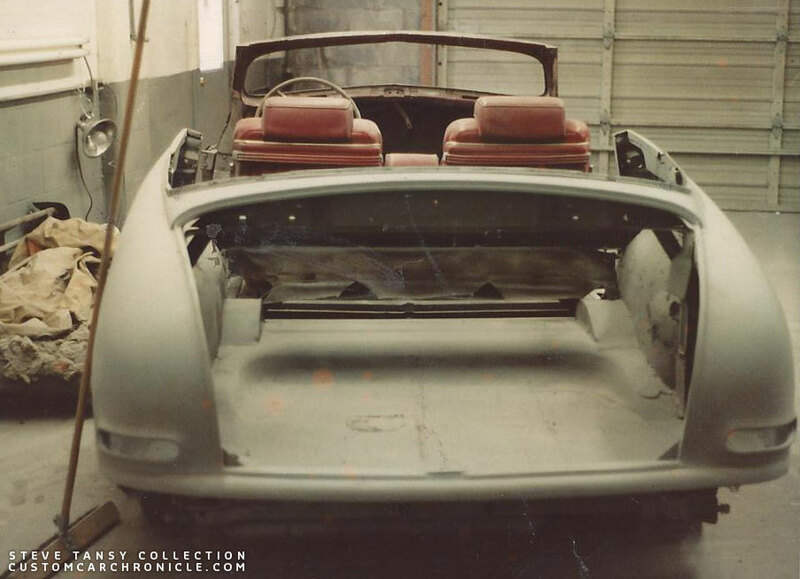 When Barry owned the car in the early 1980’s he stripped the car to bare metal and while doing so he found out that the car was custom painted twice. Once in a purple with a lot of toner, and a bit later in a Buick maroon. The car was original a champaign color when it had left the factory. Barry also mentioned that the original crests were still on the fenders and the Hauser Carson Top header tag was in a paper envelope. The holes for the tag were in the header bar of the parts left of the original top. During the initial stages of the restoration Barry got in touch with George Barris to ask about the history of the car, since it had Barris crests on the front fenders. 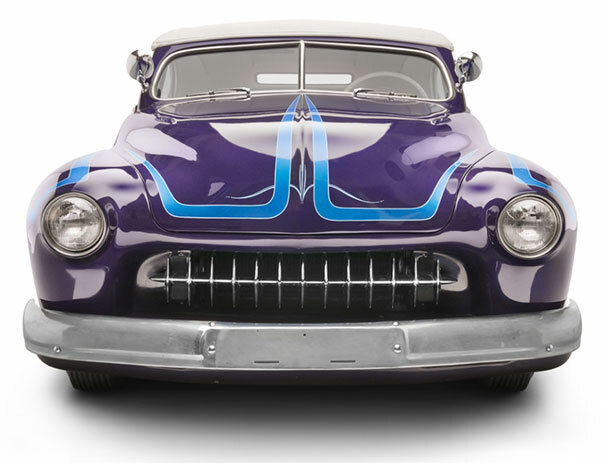 Back then George did remember the car and could tell Barry that the Barris Kustom Shop painted the car purple in 1952 and after they had chopped the windshield and when the Carson Top Shop had done the top they repainted it in a Buick Maroon in 1953. Barry mentioned that George told him all this before he even had seen the colors Barry had found when stripping the car. So he knew then his Mercury Custom Convertible was genuine. George remembered a few more things about the car back in the 1980’s before he ever laid eyes on it, all accurate. 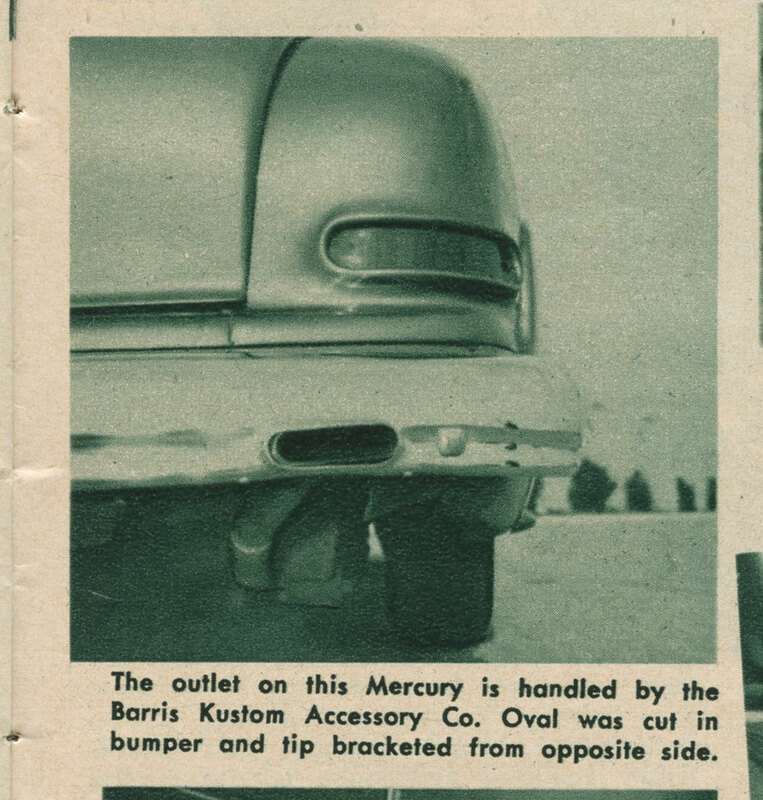 Barry also mentioned that with the help of George they were able to locate one photo of the Mercury used in an Barris Korner article in the may 1954 issue of Rod & Custom Magazine. According to George, back then, he thought that was the only photo of it that was ever published. Sadly he could not remember the name of the owner. 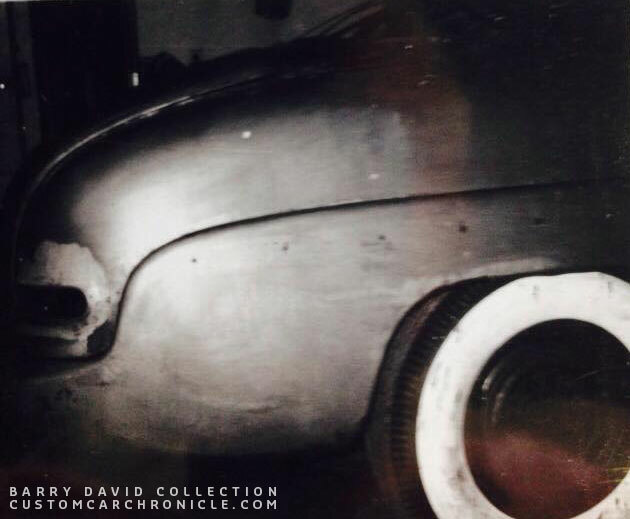 The May 1954 issue of Rod & Custom Magazine shows the right rear fender of the car. It shows the Barris Shop created taillight openings and taillight lens. The bushes in the background looks like the this photo was taken at the Compton Drive-In theatre. The same location as the other photo was taken… possibly during the same photo-shoot? The R&C article was about exhaust outlets, and the once on the Mercury were not on the car anymore when Barry got it in 1981. Barry mentioned the car had stock bumpers all around with an extra horizontal bar in between the bumper guards on the front. Although these parts were all stored in the trunk. But the taillight openings and even the actual taillights that where on the car in 1981 are the exact units that show in the R&C photo. Those taillights were made from frenched steel rod in a new opening low on the rear fender, below the stock location. The original lenses were in the trunk. They were made from fluorescent lighting panels and were dyed red. The bulbs were hung on a piece of scrap strap metal. Barry also mentioned that when they stripped the paint there wasn’t a single lead or braze crack in the entire car! Sam Barris did great custom work! This photo (cropped) will appear in the Photography of George Barris book. The photo was taken in 1952-53 at the Compton Drive-In. It shows the Henry J grille, the shortened side trim, location of the Barris crest, round hood corners and frenched headlights. When Barry told me about the Henry J grille that car with the car originally, my head was spinning and I knew I had seen something similar. And I remembered where. In the new, not yet published (at the time of this writing) book on the Photography of George barris there is a chapter on models with cars. And in this chapter there was a photo of a 1949-50 Mercury convertible I had never seen before. 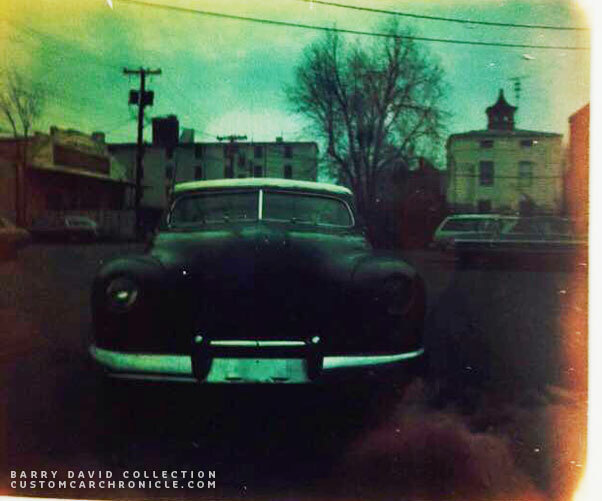 The photo is taken in 1952-53 and it shows an unchopped Mercury convertible with all the body mods we can see in the mercury from the Museum, as well as a grille based on Henry J end parts. Sadly the center point is not visible., but the rounded hood corners, the extended headlights, the molded grille shell, shortened side trim location of the Barris Crest, everything is identical to the Museum Mercury. And the dates also corresponded with the story George Barris had told Barry about the two paint jobs and that the car was chopped after they had painted it purple first. So more than likely the car in the photo is painted purple. 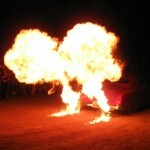 Brett Barris created the book in which this photo will appear, so I asked him if he had come across more on this car. Sadly it looks like there was just this one photo taken, or at least saved. Brett showed the photo to George, but sadly he could not remember it anymore now, and also could not remember the stories he had told Barry in the early 1980’s. Snapshots from the initial restoration by Barry David and Pete Marriott. Two very dark and faded polaroid snapshots show the Mercury in primer, not to long before it changed hands and Bob Larivee became the new caretaker. 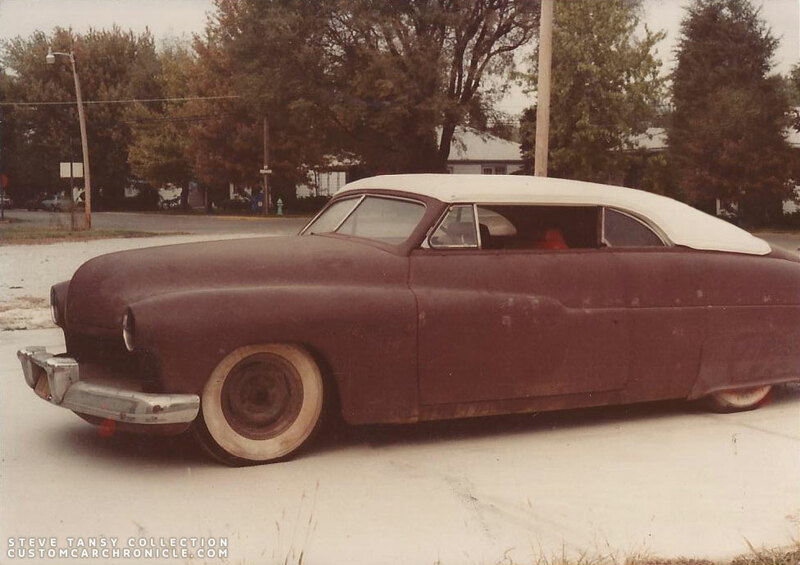 So we have come pretty far with identifying this 1949 Mercury, but what we do not know is who was the original owner of the car. The guy was was in the service and stationed in California, and later moved back home to Hartford. Barry David also mentioned that the reason why the car looks like like it does today, and not like how it was looking back in 1953 was because Bob Laravee thought that the original colors were not bright enough for the kids that attended his shows so they brightened it up. Steve Tansey did a great job finishing the car but it would have been much better done in the original maroon without the scallops. Time frame what we do know. 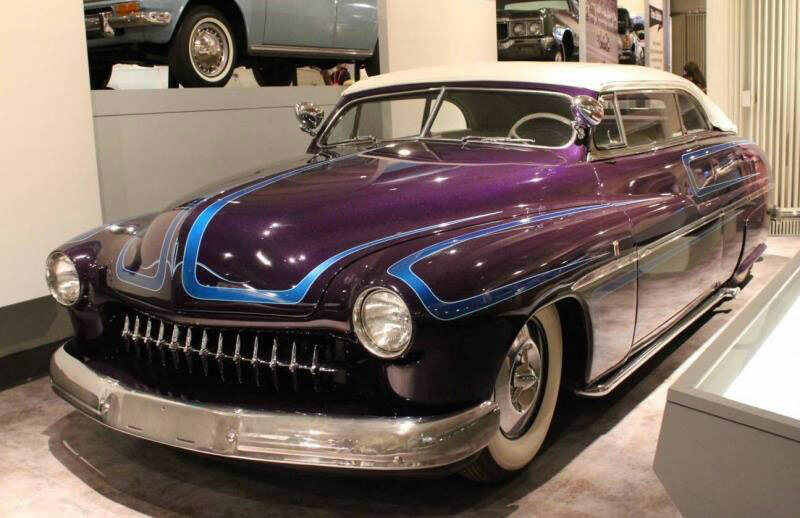 1952 Mercury was customizing and painted purple at the Barris Kustom Shop. 1953-54, original owner was stationed in California and after he was discharged from the service he went back home to Hartford. Late 1970’s Chris Carrier from Connecticut discovers the car, and buys it from the original owner. 1981 Barry David buys the car to restore it to it former Barris glory. 1981 – 1985 Barry David and Pete Marriott did the majority of the restoration. 1985 Bob Larivee makes a deal with Barry to trade a 1941 Ford Custom for the 1949 Mercury. 1985 Steve Tansy is commissioned to restore the Mercury for Bob Larivee. Bob wants the car a bit brighter and more “modern” than how Barry wanted to restore the car. Around 1988 till now, Mercury goes on loan to the Henry Ford Museum. Later the Museum buys the car from Bob Larivee. A great example of the hideous ‘custom revival’ style of the late 70’s and 80’s. It is sad that it is in the Ford museum as an example of a custom. Having said that, it is not a s bad as most from the ‘revival’ period. As coincidence would have it, I have been looking through some old issues of Street Rodder from that time (I keep mags for ever) and I’m been quite surprised at how many customs were featured, most pretty horrible. It is also funny to read the story titles …”just like the old days…” err, no. Last night I was looking through a favourite, the classic August 1977 issue which was the “special Merc issue.” There are stories by both Greg Sharp and Pat Ganahl, covering the history of the Merc customs, with most of the familiar icons covered. One feature car is very similar to the subject car, done by Miles Masa from Illinois. Similar, but not the same car. Curly Tremayne’s was a fresh car then and stood out for it’s understated, single colour, restrained beauty. On the other hand, Steve Gonzales fresh one was more of a single colour take on the Hirotaha Merc. I just finished reading your article about the Merc convertible. 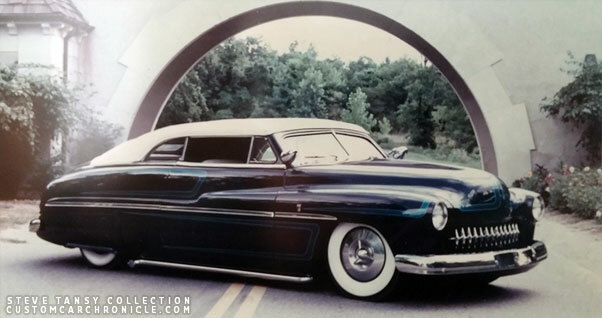 Just recently, I stumbled onto a picture of this car from an early 90’s Rod & Custom magazine. I seem to recall that the pic was featured in an article about the Ford Museum. I do clearly recall that the editor mentioned that this car reportedly had ties to the Barris’ shop and also stated that the original version featured a Frazer grille which was too badly corroded to re-use. I can’t help but wonder if the alleged grille looked similar to the one built by Barris for Dan Landon’s Chevy. I will find my magazine once again very soon and scan the image and text for you. That would be fantastic if you could find it again and scan it for me. I will add it to the article…. hmmmm I must have that issue as well. I do not recall reading it… But then… I do get older, and might forget things??? Oh boy. I’m away from my vintage magazine file cabinet for a few days. I seem to recall that the very same issue featured coverage of St. Ignace, Michigan hence the reason the magazine staff was in Michigan at that time. I will definitely find the article for you next weekend. And oh boy …I wish I couldn’t relate with your comment about getting older and becoming forgetful, but I sure do too. Found the article… and added the scan to the CCC-Article. 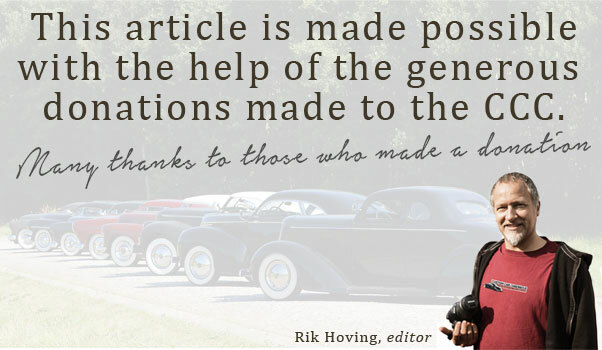 Thanks Rik, for the outstanding investigative research. This article has been the highlight of my week. Very cool story. Snapped a couple of pics of it at the museum 1990 but never realized that it could have been the real deal. That Frazer grille surely might be a Barris connection. Not only did the Dan Landon Chevy use one, but The Grecian Studebaker also incorporated 1951 Frazer pieces. Could Barris have repeated a successful application again? Or, what became of the pieces from the Landon car? Too, during restoration, was there any paint chip clues as to the car’s paint history discovered during restoration? That both the Barris crest and the Carson tag were on this car understandably has you digging deeper, Rik. That’s what you do best! Maybe other readers can help further! memo, your right the merc looks good in black & white ! it looks more @ home ! 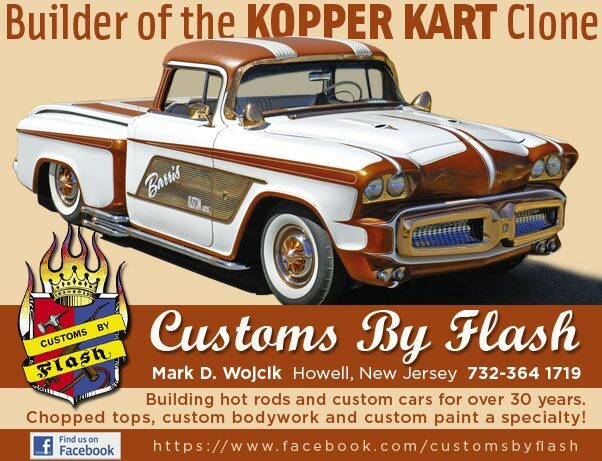 Whenever I hear of a custom being sold in Hartford in that time period, I immediately think of Bob “Red” McCormick. Red was a great customizer in his own right, but also owned customs built by others. 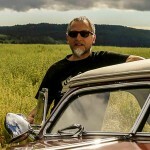 He owned the the Burt Hamrol Ford when I met him at custom shows in the eighties. If anyone has a Hemming magazine collection from 1980-81, they could look for the ad and perhaps identify the seller or maybe even find a picture with the Frazer grille. Dave, I have made some more progress on this Mercury since I started the article. And I will update when a few people get back to me with more info and hopefully some photo’s of how the car looked in 1981. I do now also have two photos from the car from around 1953, and will be sharing those then as well.. Working to get more, hopefully soon. Kudos to you, Rik. What a wonderful forum CCC has grown into. Where else could this sequence of sleuthing and new clues volunteered from such widely diverse places all come together to substantiate this exciting historical development!! I was like a kid anxiously awaiting the next Saturday 10c matinee to see the next episode of a cliff-hanger serial. Thanks to all who chimed in to help you track this one down!!! Man, i love when you’re relating about those kustoms investigations you’re making !! that’s fascinating ! !